for drinking water supplies, irrigation and/or recreation. 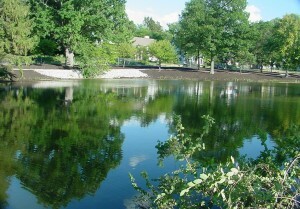 •Lakes are majorly for storage of water. •Most riverine lakes (oxbows) play a very important role in flood mitigation and groundwater recharge. •At the landscape level, large lakes significantly influence microclimate and therefore influence biotic diversity. •Man-made lakes have been constructed mostly to store seasonally available water, usually for urban water supply and/or irrigation. •Power generation is generally a collateral use. •Most lake pollution problems are caused by nutrients, contaminants, and sediments carried into the lakes. Soil particles carry more than 90 percent of the organic nitrogen and phosphorus originating from upland agricultural practices. •In a typical watershed, nutrients may come from sewage, wastewater, agricultural and urban runoff, and atmospheric fallout. In recent years, heavy use of fertilizers and pesticides and high rates of soil erosion have increased the severity of the problem. •High concentrations of nitrogen and phosphorus are the main causes of algal growth, which results in the deterioration of the lake water quality. •Ministry of Environment and Forests. 2008. Guidelines for National Lake Conservation Plan. National River Conservation Directorate, Ministry of Environment and Forests. Government of India, New Delhi. 14 pp. •Hyderabad Urban Development Authority. 2005. National Seminar on Management of Urban Lakes, 1-2 Dec 2005. Proceedings. 28 pp. •Gopal, B., A. Chatterjee & P. Gautam. 2007. Sacred Waters of the Himalaya. WWF-India, New Delhi. •Kodarkar, M.S. & Sandeep Joshi. 2006. Conservation and management of lakes in urban environment; bioremediation a new frontier in the control of eutrophication in urban lakes. Proceedings Vol. II, 11th World Lake Conference, Nairobi, Kenya. Pp. 79 – 82. •Lake Conservation Authority. 2008. The Lake Atlas of Madhya Pradesh. Bhopal. •Ministry of Environment and Forests. 2009. National Wetland Conservation Programme: Guidelines for Conservation and Management of Wetlands in India (Revised on 12.06.2009). Conservation and Survey Division, Ministry of Environment and Forests. Government of India, New Delhi. •Prabhu Dan Charan, Renu Sharma and K. C. Sharma. ‘Gas ChromatographicAnalysis of Organochlorine Pesticides In Lake Anasagar of Ajmer, Rajasthan . in Journal of Environmental Science & Engineering. 90/8/2009 (In press). •Charan, P.D. and Sharma, K.C. Analysisof residual pesticides in surface and ground water samples of central Aravalli region of Rajasthan.International Journal of Bioscience Reporter, 2009.7(1): 15-20. •Singh, S., Dureja, P., Kumar, S. and Jain, M.C. Persistance of α and β isomers of endosulfan and Endosulfan sulphate in diverse soils of India as influenced by flooding. Journal of Environment and Health. 1999. B-34:965-974.